If you received a new TV, stereo, car, or any other item that was stolen and you think that since you are not the person who stole it, then you must be off the hook—think again. In New Jersey, it is a crime to receive stolen property. You may have gotten a good deal on a flat screen TV, but if you end up having to face the consequences of a conviction for receiving stolen property charges, you will wish you paid full price at Best Buy. Basically, if you know or believe that someone is selling or giving you property that they do not own or have a right to give away and you accept that property, you are violating New Jersey law. If you have been charged with receiving stolen property in Camden County or elsewhere in South Jersey, an experienced criminal defense attorney can be your greatest asset when confronting these serious charges in court. William C. Fay is a passionate criminal lawyer with years’ experience defending clients in courtrooms throughout New Jersey, including in Pennsauken, Gloucester, Camden, Cherry Hill, Voorhees, Winslow, Belmawr and Haddon Township. With the help of Mr. Fay and the team at our law office, you can successfully fight the charges and penalties for face if arrested for receiving stolen property or another theft crime. Call 609-832-3202 for a complete review of your case and learn what you can do about your current situation. We provide consultations free of charge. A person can be charged with receiving stolen property under N.J.S.A. 2C:20-7 if they knowingly bought or received property that is movable while knowing that the property was stolen or believing it was probably stolen. To be convicted, the prosecution must prove that you knew that you received the property and you knew or believed it was stolen. The law will presume this knowledge if you are in control or possession of two or more pieces of stolen property on one or more different occasions, received stolen property on another occasion sometime the year preceding the current incident, or you are in the business of buying and selling goods and failed to make reasonable inquiry as to the source of the goods you received and whether the person you received the goods from had a right to possess and dispose of the property. 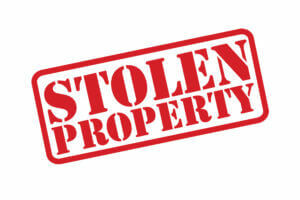 In New Jersey, receiving stolen property is charged and punished according to the value of the property received. If the stolen property is worth less than $200, it is a disorderly persons offense and, if convicted, you may face up to 6 months in jail. It is a fourth degree indictable offense to receive stolen property valued between $200 and $500, with potential imprisonment of up to 18 months and up to $10,000 in fines. If you knowingly receive stolen property valued at greater than $500 but less than $75,000, or property that is a blank New Jersey prescription, one kilogram or less of a controlled dangerous substance (CDS), motor vehicle, boat, vessel, airplane, firearm, horse, or domestic animal, it is a third degree crime and you may be sentenced to 3 to 5 years in prison and fines up to $15,000. It is a second degree crime to receive stolen property valued at $75,000 or more, the property was taken through extortion, or the property is more than one kilogram of a CDS. The charge carries potential penalties of 5 to 10 years in prison and up to $150,000 in fines, if convicted. If you are facing criminal charges for receiving stolen property in New Jersey, it is important to be represented by an experienced criminal defense lawyer who can effectively argue your defense. Defenses for receiving stolen property charges typically require a deep understanding of the law and the requisite level of mens rea. You may also have other options for getting your charges dismissed, such as the Pre-trial Intervention Program (PTI). In other words, you don’t want to run the risk of not knowing what or how to pursue the best option in your case. For more information and to speak with a criminal attorney today, contact us 609-832-3202. You deserve a thorough understanding of your charges and your situation, so call for a free consultation with a lawyer who can help.